Recently, I got a new carbon fiber interchangeable needle set (Karbonz from Knitter's Pride). As you can imagine, I already have an extensive needle collection, so you might ask why I need a yet another set. The short answer? Gauge. Each of my needle sets are made from a different material, which can affect both stitch and row gauge. I was curious how I would knit with my new needle set, so I designed an experiment. I knitted up a stockinette swatch (30 sts x 45 rows) with each needle type, then blocked them all very, very carefully to be sure they weren't stretched. After the swatches dried and kind of mellowed out for a while, I took careful gauge measurements. Then I used the results to figure the dimensions for an average sized sweater that is 200 sts wide and 150 rows tall. The results really surprised me: if I knitted a sweater with one kind of needle versus another, I would have about a 2" variation in either width or length. That's a big difference! I was also curious about differences in my "flat vs. circular" gauge because I've had trouble with sleeves not matching the sweater they are attached to. So I got to work on a circular swatch with my wooden dpns. Results? There is a difference, of course. If I knitted my 200 st x 150 row sweater with a circular construction, it would come out 1.5" narrower than if I knitted it flat with the same wooden needles. Surprisingly, the row gauge was unaffected. So what's the take-away from all this? 1. Knit your gauge swatch with the same needles you plan to knit the garment with. 2. Knit circular swatches for circular garments. 3. The more stitches in a row, the more a difference in gauge affects the finished measurements of the garment. 4. If you need to connect a circular-knitted sleeve to a flat-knitted body, make a separate circular gauge swatch. If you knit like I do, you might need to go up a needle size or switch to a needle made from a different material to get the correct gauge. I hope you found this post informative! I know I will probably reference it often in the future. I'd love to hear what you think in the comments section below. AND, If you haven't seen Homage: Knit Darling Book 2 book yet, go check it out! The collection features 5 gorgeous new knitting patterns inspired by Modernist art and design, each piece honoring a different pioneering female artist from history. I could not be prouder of the collection! Thank you for doing this experiment! I noticed a dramatic difference as well in my own knitting gauge when I changed needle materials. I would not have thought that the material your needles are made from could make such a difference...but it does. Even the type of wood used (bamboo vs. birch) can make a difference for me! 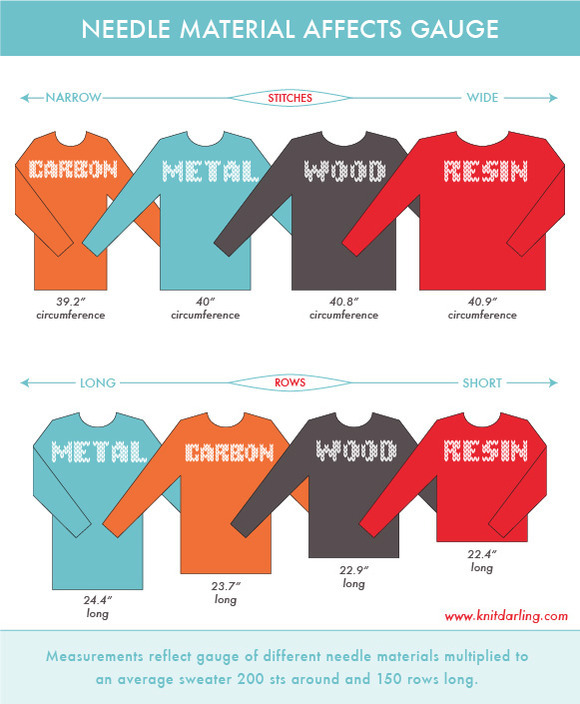 I have known that wood affects my gauge differently than metal, but it's good to see it in a graphic. Will be on guard the next time I think to use different materials in the knitting of my sweaters. Thanks for doing the leg work, or should I say hand work! You are Awesome!! Such useful information. I will definitely keep this in mind. you rock!! Who knew? Wonderful post. I very often have to adjust recommended needle size but I never took into conisderation the type of needles I was using. I will be making more swatches from now on! I will repeat your experiment with my needles. I know my woodens give different gauge than my metals. I also get different gauge with my square needles. Robin, I haven't had the opportunity to try square needles. I'm curious what your results will be! Darlene- The swatches were all about 6" x 6", give or take a little of course. The needles all measured perfectly at 4.5mm, so really this experiment is all about hand tension. The different needle materials caused me to make my stitches a little differently in each case. Hmm, I've been having trouble getting gauge (too tight!) with my Knit Picks nickel plated circs..maybe I should invest in some wooden ones? I'll try some swatches asap. It may be that it is not so much the material but the needle manufacturer. I explored this issue several years ago when using a circular needles from several different manufacturers. There are no industry size standards or accepted tolerances, so an Addi 7, Knit Picks 7, and a Denise 7 may not be exactly the same size. As you say, the more stitches you are using in a piece the more the differences become apparent. I have also noted that I knit a lot tighter on circulars than on my DPN's, even when they are from the same material. That is why I usually knit sleeves on my DPN's. My teacher's motto: "The Wages of Sin is Not Counting Your Gauge." I knew that the different needle materials affected the stitch width but I had never paid any attention that it also affected the row width or that you might get a different gauge on circular needles. I'm trying to figure out why circular needles would make something smaller but not shorter? I agree with Fran - I'm terrible with keeping my needles straight, and had two gauges, and noticed that they said different things for my small sock needles. I bought an industrial drill bit gauge, which had a lot more different diameter holes, and noticed that some of my labelled sevens fit into one hole, but others didn't fit in for two more holes down - there are wide differences in the width of needles. If you haven't put them all in a needle gauge and seen that they're the same size, they're likely not, and that's probably a bigger cause of gauge differences. Also, depending on how you knit, a long taper may mean tighter stitches, because you're wrapping yarn around a smaller diameter part of the needle. Your scientific method is admirable, thank you for posting your results! I find that my gauge is effected by temperature. I live in Eastern Oregon, where temperature variations are extreme. Though the winter temperatures here can be well below zero, the summer temperatures are well above 100. Wooden needles in winter and metal needles in summer make the same gauge for me. Thanks Heather, I never thought about temperature being a variable. There are so many things to consider! Great things to think about. I wonder if or how the brand of a certain type of needle would change the gauge. Loved your experiment and the information you provided. I always knew I knitted differently on different types of needles. It is nice to know I was not crazy. 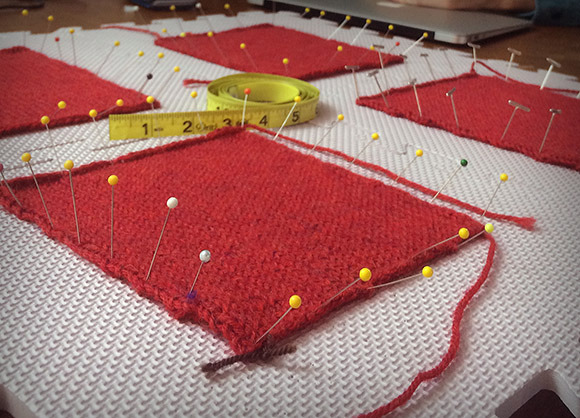 When using square needles it is suggested using one size larger than specified in the pattern; that being said, needle size matters little, as long as you achieve the required gauge. And, yes, temperature and humidity will affect both the needle material and the knitter. So, your gauge will differ with the same needle depending on these factors. I reccommend checking gauge every couple of inches and adjust needle size accordingly. Excellent experiment, this is exactly the kind of thing I look for in the knitting blog world. I almost never knit with anything other than Addi Turbos, but there are so many new needles on the market that I have started to get curious. Must keep this in mind. I recently knit my first entrelac scarf. I started it on ChiagoGoo stainless steel needles which were more slippery than I wanted so I changed, in mid stream, to my wooden Dreamz needles in the SAME SIZE. The stitches were noticeably larger so I had to frog what I'd done with the wooden needles and go back to the stainless steel ones. It just occurred to me to put my husband's micrometers to work and measure, to the thousandths, the needles made of different materials. Temperature would affect the metal needles and humidity would affect the wooden ones. I also think there must be a range of dimensions to a size that the needle makers go by.. I've also noticed this in yarn of a given size. Caron's Simply Soft yarn in size 4 is not the same as Vanna's Choice yarn in size 4!!! The moral of the story is SWATCH, SWATCH, SWATCH. And the moral to the story is and should always be, "SWATCH". Than known s so much for posting this important info. I think the TKGA would be interested in your test and essay. Hope you will send it to them. Thanks for your efforts and for sharing! Based on this, my next sweater should be knitted on my Denise's, since I am a size 14 petite (wider and shorter). However I can continue to knit my socks and hats on my square Kollage needles, as I wear a size 7 shoe and a 6 1/2 hat. Good to know. . I am really happy about you experiment and I think I will have to do my own to include KA bamboo ( I find they give me a looser gauge than my Harmony) I also have Cubix, Chiagoo lace and Hiya Hiya Sharps with tend to give me a tighter gauge than my KP Nova interchangeables. I plan to make a swatch binder with each type of needles I own. Thanks for the information and inspiration to do my own experiment with my knitting style ( I tend to be a loose throwing knitter). I also think it would interesting to compare throwing to continental style. Thanks for this post, it's really useful. I'd really never thought about this at all. I'd also never considered how humidity or temperature might affect needles or yarn, as some mentioned in the comments. One super picky note: Affect is a verb, and effect (in this sense) is a noun. So the title should be either "Needle material affects gauge" or "Needle material effects on gauge." Interesting. I have real gauge variability problem. I'm a very loose knitter and usually have to go down at least two needle sizes. I bought myself a set of Karbonz needles for Christmas, in anticipation of my goal this year of knitting sweaters for myself. I was happy that my new serious attitude was helping with gauge issues, but it may very well have been the needles. The temperature and humidity issues are probably also something to take into account. Another reason to work a project through to completion - the environmental variables are more likely to be stable. Thanks for the great post! What an informative post. I've noticed this difference myself and I love your scientific testing of each variable! Super-interesting! I can definitely attest to the importance of circular swatching -- my gauge is much, much tighter in the round (I purl loosely, I guess). I put together the newsletter for my local guild and I may ask your permission later to use some of this in a future issue! The lengthwise gauge is shorter for circular knitting because the throw for a purl stitch is longer than for an knit stitch. For a knit stitch the yarn is brought up from the bottom between the needles, but for a purl stitch, the yarn is brought over the top of the needles in order to get the stitch to hang correctly on the needles. This creates a slightly larger purl stitch than knit stitch. You can correct this by bringing the yarn up from the bottom and between the needles on the purl stitch, but that would require you to compensate for the change in how the stitches hang by knitting into the back of the knit stitches in order to flatten them out. While this wouldn't be too onerous for a piece of flat knitting, it would be very confusing to keep track of for patterns with ribbing or changes between knit and purl, so use with caution! This was a great post. It will make me take more time when swatching for sure. I usually spend a minimal amount of time swatching and prepping for a project. Thanks! I, like others who have commented, did not know the difference needle materials had that much effect on the finished product. I have noticed a difference between metal and wooden needles and have adjusted accordingly, but that 's the extent of my testing. I'll be more diligent in my trials from now on. This was very interesting. I often wondered how my gauge could be so different from what was listed in the pattern (many times 3 or 4 sizes). It would be interesting if the patterns could carry this information from the test knitters but it would probably be on unwieldy proposition in most cases. Was not surprised about the width, but the length was shocking! Thanks. This is very interesting ! Another reason to use swatches. I have to branch out from using patterns that have "no gauge swatch required". Nice to hear about the variety of needles you use. I'm enjoying using needles my mom used but have bought plastic resin, bamboo, metal, and I'm always on the lookout for them at yard sales. Thanks for the information. Very worthwhile.. Thank you so much for clarifying this for me!!! I've just recently started routinely swatching, but I have multiple brands of needles...therefore I should probably get a full set of one kind I really love and go from there. Wow. This is a great post, excellent information and completely new news to me. It kind of blew my mind, how much of a difference the composite materials of the needle could make! This certainly goes a long way to explain some mysterious results in finished projects that a person has made repeatedly. Thank you, Alexis! Thank you for documenting this information in one handy place! I've noticed the exact things with different fibers/needle combinations...It has led to a needle stash in addition to yarn stash! You didn't state the actual gauge you were working towards just the number of stitches and rows you completed - I would be interested in knowing if any of your swatches met an actual gauge then you would know which needle works more accurately for your own knitting style. Your experiment did prove the age old adage of "swatch and gauge"! You have more patience than I to have done this for sure. Lee, you're right. I didn't state a gauge that I was working towards, because I wasn't really trying to achieve a particular gauge. I guess this is the designer in me. Usually the way I begin a garment design is with a schematic. Then I pick a yarn and try it out on different sized needles. The needle size that I choose for the pattern is based on how attractive the fabric looks and feels to me. Then I use the gauge I get to figure out all the stitch counts for the pattern. This is amazing and most educational. May I share this with our knitting guild newsletter? It proves, again, the importance of swatching. Do you think the difference had to do with material, or with the different "flex" in the joins between needle and cable? I've noticed that flex definitely impacts my knitting (even non circular) but never thought much about material. Interesting! Lacey, I've never thought about the join in the needle being a variable too. Perhaps you're on to something there. I have noticed the gauge difference between using wood needles and bamboo needles as well. My gauge is much larger with bamboo needles despite being the same size, There was such a difference I went to my needle gauge just to be sure I had the same size needles. I thought it was just me. I have an electronic caliper and have seen slight size differences in needles of the same marked size. Also, the length of the point (tip to full thickness) makes a difference, if you have long points they knit tighter. Can you measure and see if that might be it, versus material? Hi Lute, You're right that different needles might have slightly different measurements even though they are marked with the same number. Though all of my needles appeared to have very similar tip tapers, and they all fit snugly into my needle size tester hole (I don't own an electronic caliper), there are so many other variables that can affect the way your stitches form. My goal with this blog post was to drive home the importance of using the same needles for swatches as you do for your actual project. Thank you for this excellent post! I have done a comparison of just the needles, but never thought to consider the TYPE of material the needles were made from. This is enlightening ! Really interesting! I've just discovered that the length of the points of the needles makes a significant difference to my gauge, as well as the speed at which I can knit, and how long I can knit for. Jesse, thanks for your comment! I think it's all about how the stitches form on the tips of the needles, and the length of the tip would certainly affect that. I feel like when I knit with very slippery needles, my hands tense up more which can definitely cause fatigue over time. Very fascinating! Thanks for posting it. I'm curious as to whether you have looked for differences in either of the following: 1. Different shaped needles of the same size (ie. Nova vs. Nova Cubics). 2. Different types of wood. Do you think the same findings would hold true for crochet hooks? Hi KnitsWithRaceCars, Thanks for your comment. I think there are many factors that can affect how the stitches are formed. It has to do with where the stitches are actually formed on the needle tip, and how tightly the yarn is held as the stitch is being made. If I'm using a slippery needle, my hands aren't as loose and my stitches get tighter. The real take-away is that you should always do your gauge swatch with the needles you intend to knit your project with. Otherwise, you might have some unexpected results! I imagine the same should hold true for crochet hooks, though I admit I'm no expert in that area. Wow! I never knew this and it had never occurred to me that materials could make such a difference. Thanks for the time and effort you put into this experiment and sharing it with the rest of the knitting world. This has to be the coolest info I've EVER read learning about knitting. I'm new to knitting and had no idea that they would differ your gauge do differently!!! You'd think that buying the same size needles would make the same size projects. Thanks for doing this and sharing it with us! This is a stunning blog post and most informative. Is it safe to say then that the piece made with wood, seems to be the most 'balanced' (for the lack of a bettere word)? I have been wondering about this issue for a while now as there is a totally different look to my work if I knit or crochet with wood instead if aluminium. It is neater and my tension is more steadfast. With plastic, it is just the opposite; it doesn't look neat at all. It is as if I have more control with wood. The slip is just enough, not too much. Yes, yarn plays a bit part as some are more slippery than others. Howeveer, I am still to find a yarn with which wood doesn't work well. Very interesting! I'm a crocheter and I'm now curious if the same holds true for the materials of crochet hooks. I may have to do my own experiment! My question for you: what is it about knitting needle materials that causes such a wide variety of gauges? Does it have to do with how the needle material grips the yarn, i.e. wood may grip yarn better because of its surface structure vs. metal or carbon being more slippery? Thanks for the article. for Heather, who asked about crochet hooks, the answer is a resounding YES! One brand to another marked as the same size, and with the same material makeup, will affect your gauge. Even the same brand sizes will affect gauge depending place of manufacture. Different materials, same size, different brands, too. So like Alexis says here, swatch with the hook you plan to make the project with! Great experiment, Alexis! I saw a link to this on Ravelry and loved the article. My conclusion from your experiment is that the yarn and needles used show that it is Metal Needles that knit up to what the standard gauge is in patterns for 200 sts and 150 rows; i.e., 200 sts = 40" at 5 sts per inch on No. 7 needles, and 6 rows = 1 in. Therefore, I conclude that most patterns are test knitted using metal needles. This is something to really keep in mind when we start a project where gauge matters. Swatching is important. Thanks you so much for this "heads up." This post is very useful, thanks!!! We've got a lot of knitting grannies and were wondering what makes the size so different when using the same pattern. It couldn't only be the hand of the knitter. It's very clear now we will have to decide on which material to use for each pattern. h'm. i wonder if the differences would also change between knitters? i.e. : if i repeated your experiment, would my gauge swatches be in a different order than yours? h'm . . . also sounds like it would be an interesting and informative class to hold. Interesting results. I crochet more than I knit but I think I have the same brand and materials for most of my hooks and needles. I'll keep this in mind when I do pull out those bamboo dp's I bought on clearance. I'm also curious about how dyes might affect the gauge in different colors of the same yarn. I recently crocheted amigurumi elephants for my 8 grandchildren using different colors of Red Heart Super Saver yarn. You probably wouldn't get this in the nicer yarns you would want to use for sweaters but some colors ended up remarkably different in size than others. Of course, making 8 of these with a much smaller hook than is typically used for the size of yarn, fatigue might explain at least a part of the difference. But I've noticed with other projects that some colors have a different feel than others in some of the less expensive yarns I've used. I have a theory on why this has such an effect. I read through many of the comments, but not all, so I apologize if someone else has already reached this conclusion! But, what I take away is that the more grippy materials result generally in shorter, wider stitches, and the metal in particular results in a very long stitch. I think this could be a result of how the yarn and the piece as you knit it ends up hanging on the needle and actually stretching out the yarn ever so slightly. It makes sense that a slippery metal needle would cause the yarn to hang quite a bit and stretch the stitches longer (and as a result, narrower) whereas a wooden needle with a decent grip on the yarn would hold the knitting in place, keeping the stitches from hanging and stretching out. I wonder, too, if the same test would yield results as varied in much smaller needles/yarn. Socks, for instance, are very lightweight as you knit them, and I wonder (if my theory is correct) if the pull of the knitting would effect the gauge so drastically. Just my thoughts! I used to knit washcloths with a picture in them on wood (bamboo), then I decided the wood was too grabby with the cotton yarn, so I went with my favorite metal needles (Susan Bates Quicksilver) and suddenly the washcloths were no longer square, but a lot longer (rectangular). I always had a feeling it was the difference in needle material. I'm switching back. Great post! I have also noticed that each type if fiber is easier to knit with a certain needle material. I like wool with plastic or bamboo and cotton with metal. The less slippery yarns work better with the more slippery metal needles, for example. That's weird. I kind of understand why the gauge is tighter with slippery needles: you probably tighten up your wrapping unconsciously to keep the yarn on the needles. But why was the metal sample also longer? Thank you and thank Knitty for sharing this post! so do you love your carbon fibre needles the most??? Excellent work! Makes sense, since when I use metal versus bamboo needles, I notice the difference in friction which has to effect gauge! Just another argument why doing swatches is so important! That is amazing - thank you so much for the info! This is fascinating. I'm a new knitter and frankly don't even understand many of the comments. However, I now know that when I label my swatches, I also need to keep track of which needles were used. I regularly use bamboo/clover brand (is this included in the wood category? ), wood (just bought a set of Knitter's Pride Dreamz Deluxe - densified laminated birch) regular birch, Addi Turbos, Addi Natura (bamboo) and Karbonz. Have definitely noticed I need to check my needles size with the gauge each time I start a new project. Am starting to notice that I like some needles a little better than others, but right now I think Karbonz and the Dreamz are my favs. There's such an incredible amount to learn about knitting. Had no idea that it's a good idea to knit circular swatches too. Thanks for your detailed research and for giving me a lot more to think about. Very valuable information! I've had a Denise set for many years--so long that the little knobs wore off and I had to order new cables. I am able for the most part to get gauge with the size needle that was recommended in the pattern but do have to drop down a size sometimes. Recently I was at a fiber show and saw the ChiacoGoo needle sets--they come in bamboo and metal but I have never really liked metal needles so bought the bamboo. They have really thin cables-the one thing that I don't like about my Denise set. With the Denise set it becomes a bit hard to move the stitches along if you are using the size 5 needles with the cable--they are almost the same size. But, back to the ChiacoGoos--I absolutely love this set-knitting my third thing with them and I have knitted the exact gauge called for with the size needle all three times. They start at size 2 and go thru 15. The cables screw into the needles but the end of the cable is free spinning so that they DO NOT unscrew as you knit with them. The set comes with 6" needles and you can buy the 4" needles and there are slots in the carry case to accommodate the shorter needles-I am slowly buying the shorter needles!! I am considering buying the metal set but I really have problems with my stitches slipping off using metal needles especially if the yarn is at all slippery. My one big problem is that I know I get a little bit different stitch gauge if I knit in the round and then flat--as in starting from the bottom and then dividing for front and back but it's not enough to drop down a whole needle so I've never quite figured out exactly what to do about this-any suggestions? Very interesting! I don't suppose you tried the square wooden needles? I found they work up smaller! Iam a knitter for years and just learning this about the needles.I am really surprise about this.I have switch to round needles even for flat work and love it .Any thing on rounds needles would love to read up on them.Than you again for the information. Well written, i totally agree with you on affects of needle material on gauge. Thanx for this article. I'm quite new to knitting, so all facts I can get into my head is great. I got that it was important to swatch, already during my first knits, even if it wasn't important for those, but I had no idea how important it was with material and circs vs. straight needles. I have never seen anything about this before and since I almost only knit on circs in wood (KnitPro Symfonie), I have never noticed anything myself. When I started to knit socks and used thinner needles, a few needles broke (one of my dogs loves to lie down on my knits....), so I got one pair in metal and a Carbonz one - and yes, I swapped in mid-knitting. Luckily these knits were so small that it probably didn't affect them much - and my knitting is probably not that even anyway, but I'll never do that again! This is an article that I'll print out and keep in my fact file. Thanx again! Lots of good information. Thank you! Lots to think about. I noticed a difference in gauge if I'm knitting back and forth on straight needles versus knitting back and forth on a circular of the same size. Now I think it's because of the needle material rather than how I'm holding the yarn and garment. . .
Wow, Thank you very much for taking the time to do this experiment. AND Thank you for raising my awareness. Of course I know gauge is important (very important). As I mostly knit socks, I'm not wondering how my gauge has been affected by different needles. Can't wait to do my own experiment! I've told my students for years that different needle material will cause differences in their knitting. I found it most interesting that as the st. gauges got looser the row gauges were tighter. Made me wonder what accounts for this? Just goes to show you can never have enough knitting needles. Hi! Thank you so much for doing that bit of research. A few years ago I began a blanket using Vanna's yarn by Lion Brand. The pattern called for all the colors in her line. As I began to crochet all the squares, I piled the squares one on top of the other. They were not aligning. You would think that using the same worsted weight yarn in a different color using the same hook would produce identical results! This project was put aside as I didn't know how to proceed. Thank you for this! I thought I was going batty when I kept getting different gauges on different needle materials. For me, bamboo ends up more loose than metal. Thank you for this information. It is an amazing reason why its ok to buy more needles. Love them !